The Glenmasan Manuscript, written in 1238, brought to light a much older gem of Scottish/Irish literature, the Lament of Deirdre. Full of imagery of the place and its environment it is a good starting point to consider Argyll as an integral whole and the way in which it relates to its neighbours, then and now. “It is a great pleasure to be here this morning. It must be coming on for two years since I first discussed the possibility of this event taking place. I did so on the neighbouring island of Luing with my friend Norrie Bissell, and it is he and my other good friend, Mark Sheridan, among others, who have made it happen. At that time I was out of Government; released after 8 years of Ministerial office, five of which were as Scotland’s Education Secretary, which followed on two years as Environment Minister and too short a time – only 9 months – as Culture Minister. I had recently taken up an intriguing and enjoyable position as Professor in Scottish Culture & Governance at Glasgow University and I was looking forward to contributing to a range of events such as this, as well as teaching and writing in the University – all the while continuing to represent the most beautiful, and the most rural and diverse, constituency in the Scottish Parliament: Argyll & Bute. I was more than aware of Norrie’s championing of Geopoetics over many years and the idea of an event that brought to our shores and doorsteps a consideration of this part of Argyll in a wider, deeper way; a way that connected the land, landscape, environment and culture to the people was (and is) very attractive. What, of course, I did not know, is that when I agreed then to deliver a keynote, I would be doing so in very changed times and with a very changed role: back in Government and spending every day focused on the threat to Scotland that is presented by a UK Tory Government fixated not on moving forward in understanding, but instead backward in polity. So what I have to say today will be different from what I might have planned to say even twelve months ago. It may be as much geopolitics as geopoetics – or perhaps an amalgam of the two – although it is driven by my own continuing fascination with and support for, the extraordinary vision of Kenneth White. Twelve months ago of course, on this very day, we had woken up to the reality of the Brexit referendum decision (or, rather, decisions). A positive intention to stay was declared by every area of Scotland and by Northern Ireland and London, but a narrow decision to leave recorded in other areas and by the UK electorate if taken as a whole. I was driving that morning to Oban – to catch the ferry to Mull – and it was with a heavier and heavier sense of foreboding that I approached the town. On the boat I found myself holding a surgery of sorts as people approached me to discuss the outcome and what might happen next. Yet, even then we could not have imagined how much worse things were to get. The triumph of the UKIP Brexiteers was not yet complete; they had still to take over the policy and the party of Government, though that has now happened. The recent election has merely deepened the crisis. As a diplomat said to me earlier this week, when the Italian press start to describe the governance of the U.K. as “unstable” you know you have problems! But I am not going to dwell on that today – or rather I am going to approach it and its impact from a very different angle. So let me start in a different time and place. A time of greater hope. 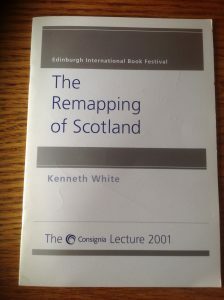 In August 2001, at the Edinburgh Book Festival, Kenneth White gave what I still think of as one of the finest lectures I have ever been privileged to hear. The lecture was sponsored by Consignia, an ill-fated re-branding name for the much better titled ‘Post Office’ which came and went in a mere 15 months (a little lesson in that). They invited every one of the 129 MSPs who had been elected only two years before. However, I learnt later that only two bothered to turn up – myself and, I believe, Roseanna Cunningham. It was the other 127 MSPs’ loss. 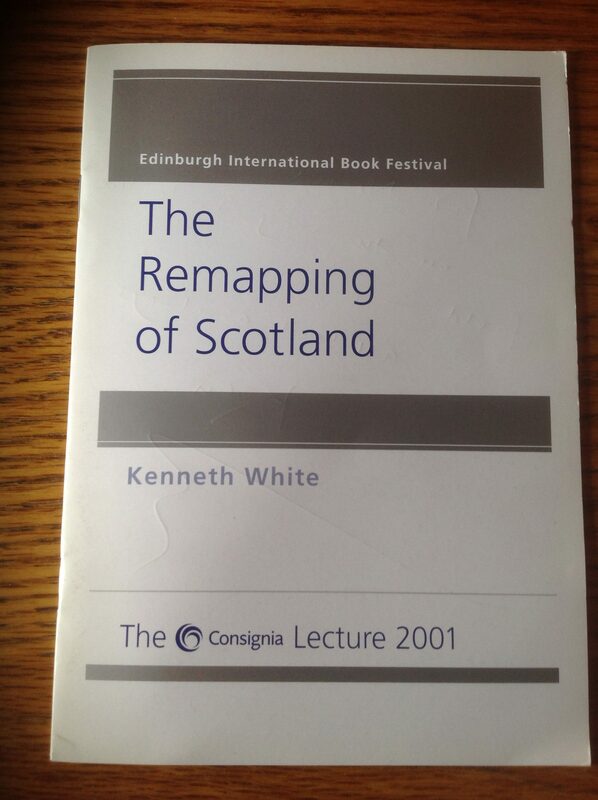 I shall draw on that lecture – entitled ‘The Re-Mapping of Scotland’ – heavily today. I want to start with an early thought from it. Both remarks are as true today as they were then. We are still in a transitional stage. Though the transition is less hopeful, the destination perhaps less appealing and more problematic. But let me too start with a ground, with the ground, which is what he calls his ‘first zone’ in the remapping of our country – a task needed more than ever. I represent a constituency which consists of a large swathe of rural, West Coast Scotland, as well as 23 inhabited islands and hundreds and probably thousands of other pieces of rock and grass surrounded by sea, which are outcroppings of a geology that floats on a plate in constant, though very slow, motion around our planet. Last October I stood on the border of ‘our’ plate – the Eurasian Plate – where it abuts onto another of the 15 large plates, the North American Plate. It is a plate, we should not forget, on which we float with the whole of Europe and which, therefore, declares some form of common destiny. At that particular point in Iceland, however, there is in the process of being made, as the Icelanders say, ‘new earth,’ for the plates are what is called in geology ‘divergent.’ Their boundary is that of the North Atlantic ridge where vulcanism brings to the surface molten lava from deep under the plate. 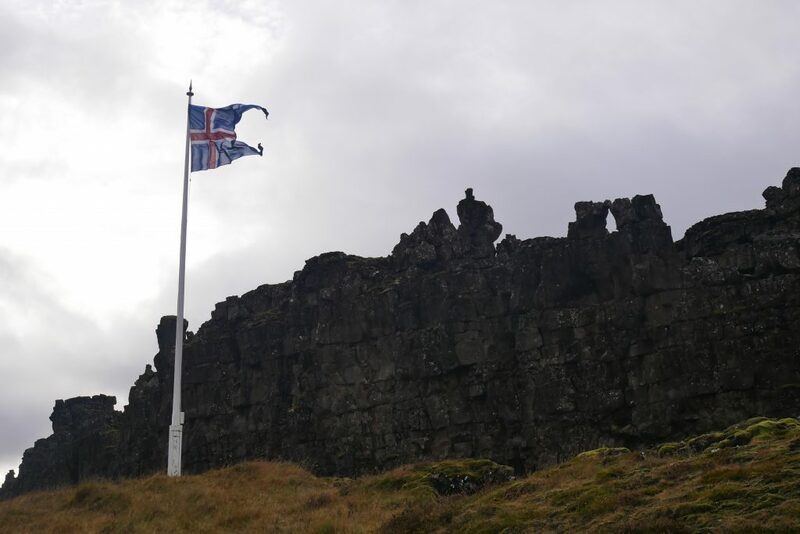 But at that spot the Icelanders also made something else: a country. For in the valley between the plates – where the new earth is being made (though at this spot the motion is presently ‘transformative,’ that is side by side) – a tall flagpole flying the Icelandic flag marks the spot where the ancient Parliament of Iceland met; and where, on the 17th of June 1944, the Republic was proclaimed, bringing an end to the Union of the Crowns with Denmark. The link between the country and the ground is obvious in Iceland. In Argyll it can be obvious too, if we look for it. 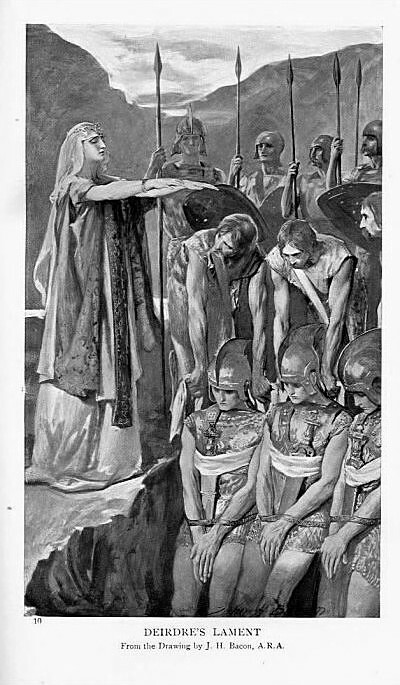 Deirdre – Scotland’s ‘Helen of Troy’ – is, of course, preparing to leave Alba, and it is the land, the landscape, the environment and the people which she is mourning, but also celebrating. When the sun struck on Glen Etive. It is the straight vale of many ridges. My delight in every man who belongs to it. Beloved is Drayen of the sounding shore! I count myself lucky today to be one of those men who ‘belongs’ to Glendaruel, having lived there for the past quarter of a century and having heard the cuckoo there often. This poem – perhaps the oldest recognisable description of Argyll – is, in every sense, ‘grounded.’ Deirdre’s Argyll is not a supermarket or Disneyland; it is a place that shapes her and us, and is in turn shaped by her and us. Deirdre had an intimate connection with, thoughts about, experience of and sensation in the landscape and the places. Just as we have, today, in the same places and landscape that have not changed greatly in a thousand years. In any consideration of country and ground we have to include people and their physical and intellectual creations as well as their state of life or death. And in so doing we move to White’s “second zone”, the zone of history, identity and culture. It is here, of course, that White in his Edinburgh Book Festival lecture was at his most critical. He despairs of the inability to draw the ‘significant lines together’ and wonders if it is possible to re-ground our country and culture, or as he later puts it , to ‘re-found’ it. His description of the ‘self made nitwit, the smart semi-educated nonentity, moneyed without being mannered’ who inhabits this space perhaps strikes a renewed chord though the intrusive ‘lap top and portable’ are probably replaced now (only a decade and a half on) by the iPhone and Twitter. ‘A virtuous populace’ wrote Burns – in that much-maligned ‘Cottar’s Saturday Night’ – ‘may rise a while / and stand a wall of fire around their much lov’d isle.’ The same thought, in a different cultural time and clad in different clothing. White’s aim, in this ‘remapping’ is the clearest thing in his text. It is to ‘refound’ and re-centre our selves within our landscape and our culture. To reconnect us to the holistic nature of existence and landscape and to raise our eyes and minds to its significance. This ‘remapping of Scotland’ was never going to be easy but the importance of the lecture is in part in its date. White saw the opportunity that a new Parliament and a new spirit of optimism had created. Unfortunately, that opportunity was not completely taken, that new optimism not completely converted in to action. Perhaps it could have never have been but the potential remained alive. And the good news is that it is still alive. There is still an energy for change in Scotland – an energy of aspiration that is more than material; a politics and public life that is still driven, at least in part, by ideas and principle. But last June a new threat appeared on the horizon. That threat may not only kill the potential, it might also unleash a process of cultural regression and political isolationism. And it is here that the poetics and the politics meet. In On the Border, White rightly refuses to take sides between globalism and narrow nationalism. World is wide but rooted. World accepts, indeed welcomes, connectedness but knows place. World has knowledge and arises from knowledge, but knowledge is deep, not shallow or easy. And world is not only out there, but in here – not only outside us but alongside us and within us. When I say ‘cultural regression’ I mean the threat from the process of Brexit that we will have our Scottish voice and our distinctive choices drowned out. That would be the antithesis of deep knowledge of place. And our political expression may be blunted by the desire of the current UK Government to follow the path of disconnectedness it has chosen no matter the views of the divergent nations of these islands for whom connection is more and more important. And when I say ‘political isolationism’ I mean the process of turning away from the mainstream of European life which is more than institutions but which is based – at its best – on a vision of peace and prosperity which has secured both those things for the lucky inhabitants of this continent for the past fifty years. In other words, turning away from a process that has built (at last) political progress on the growing together of cultural roots and which can only be weakened if we take away that superstructure. I was privileged to hear President Obama, when he spoke in Edinburgh last month, talking of the best moment to be born on this planet – now. Now, because it is, or could be, a golden age in which the wealth of the world was turned to supporting all those who are citizens of it and in which technological progress could ensure equity no matter where one lives. A golden age that could be – but which is not, yet. And voices that support that type of world are becoming harder to hear amidst the cacophony of fake news and propaganda. Of shallow knowledge. But no matter one’s view of that world, putting one’s faith in politics to change these situations is a necessary step. It is the means, still, for securing change. But recognising the deeper connectedness of humanity, not just one to one, not just individual to society, but connectedness to the ‘World’ in White’s definition is equally important. So geopoetics – as the means to ensure deep knowledge, place and connectedness – stands alongside geopolitics as a means of securing the future …the ‘world’ which is still there to be won. Sometimes this type of discussion seems pointless. No matter how much we, in this small hall – on the edge of Scotland, which is on the edge of Europe and in a state (in every sense of that word) of insecurity – believe in thought, creativity and progress, we may often feel that we are only whistling in a cold wind. But we are not. We are holding a candle in the darkness, keen to pass light to others to drive away fear. In our cultural traditions – often diverse but often with common roots – there are many examples of such actions, undertaken symbolically to encourage continued hope. In the Christian Easter vigil, for example, as dusk falls, a blazing bonfire is lit outside the church from which a tiny candle flame is kindled and then carried into the heart of the community. I stood on an Argyll hillside and had a candle in my hand re-lit by this symbolic light coming into the world at just such a vigil only a couple of months ago. A live, lasting culture – a culture to rise above the declining culture that would be the poisoned fruit of Brexit. I live with the reality of political change every day. I see at very close quarters the existential threat – and I use those words carefully but truthfully – that Brexit is. It is about much more than institutions and much more than contemporary political alliances. It is about how we see ourselves, how we view our world and whether we want ourselves and our neighbours to be grounded, to be re-founded, to be connected; or to be cast adrift and looking only inwards. Here, in Argyll, we have much around us that can remind us of that choice. And remind us that it is the ground beneath us, and the signs of continued presence all around us, that give us the best lessons in ensuring that we join in, rather than walk away. 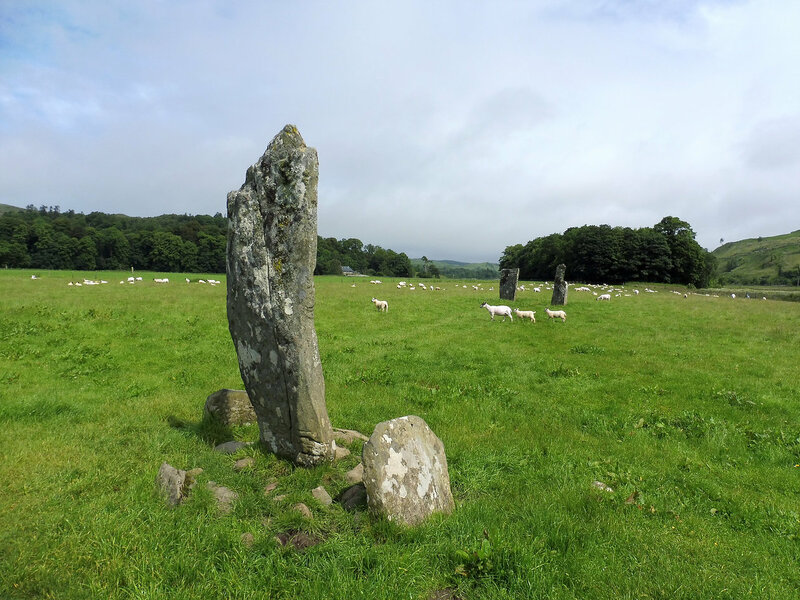 Just up the road from here there is an ancient site – Kilmartin Glen – where no doubt the questions of connection or isolation were in the minds and rituals of inhabitants long before we were ever plagued by the same thoughts. Kilmartin is a good place for me to conclude these thoughts, starting as I did in Glenmasan – a span across my whole constituency. “I never saw the intricate connections with quite this sunny clarity before, such intimate revealing of relations in brilliance, and at such an hour: the West and Islands open to the sea and Ireland, always seemed to be alive with colour: bright blue waters, emeralds and snow; but shapes and movement, glacial striations, ox-bow lakes, tidal rivers, hill-tops making patterns to each other – all connect in vision as the art of men and women finds its laws in natural reciprocation: raindrops in a quiet pool form expanding spirals on the bending plane: an ancient brooch, the lunulae – silver, gold: water, sunlight, eyes to see the clearness of design. An ‘undifferentiated time’: a time of continuity and connection. A time grounded in the world, conscious of place and knowing one’s self. A confidence even during transition, even during that transition which Kenneth White imagined taking place in 2001 and which continues under darker skies. Sail forward. Sail Forward because we have no alternative but to keep going, to travel with hope, but always to apply intelligence, creativity, poetry and even politics to where we are, where we are traveling through and to where we want to get.